Darin Strauss is a writer first and foremost. It’s his writing that has won him numerous awards, landed him on bestseller lists, and got him a spot teaching at one of America’s top universities. That said, Darin’s savvy at establishing important career-building connections provides a model for professionals in a range of fields that go far and beyond fiction. During the course of our conversation, Darin discusses the pros and cons of social media, opens up about his newest projects, and waxes poetic on the role of serendipity in success..
Why relationships must be based on more than wants. 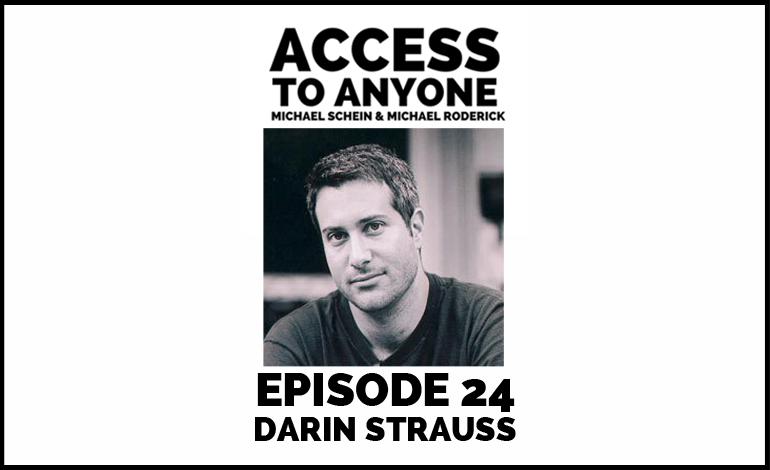 Darin Strauss is the internationally bestselling author of the novels Chang and Eng, The Real McCoy, and More Than it Hurts You, and most recently a memoir Half a Life. A recipient of a National Book Critics Circle Award, the Guggenheim Fellowship, an American Library Association Award, and numerous other prizes, Strauss has written screenplays for Disney, Gary Oldman, and Julie Taymor, and currently has a production deal with Sony Pictures Television. He is a Clinical Professor of Fiction at NYU’s creative writing program. His work has been translated into fourteen languages and published in nineteen countries.